Almost three qualifications later, Mary Sayegh has come to terms with what her future hold. Trying to find the right career path has been a journey for 24-year-old Mary Sayegh. 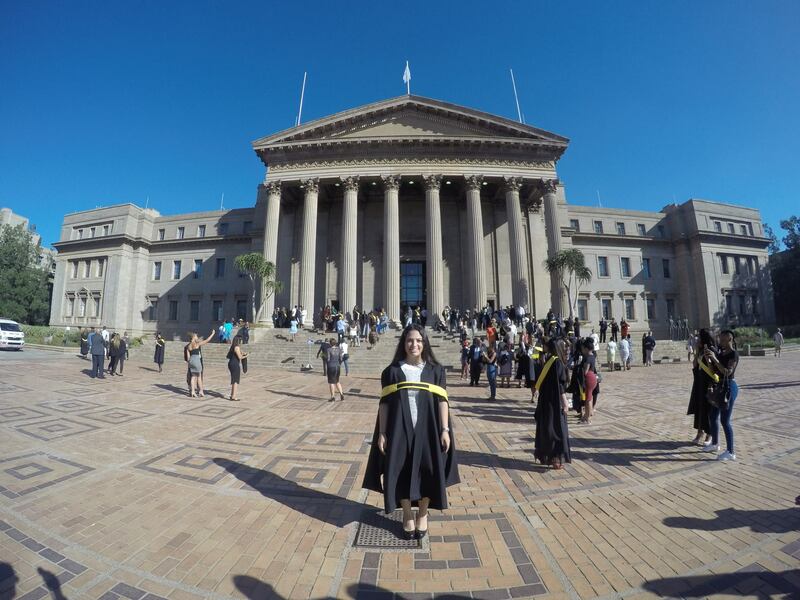 She has two qualifications, a Bachelor of Arts (BA) and a Postgraduate Diploma in Management. Her third qualification, a BA Honours in Journalism, is well on its way and will be completed by the end of November. With her final year of studying coming to an end, Mary is in a position where she is not sure about what it is that she wants to pursue a career in. Her outgoing and radiant personality cannot be confined to a desk although she knows that all jobs require one being at a desk at some point or another. Mary Sayegh at her first graduation. “I can imagine myself working behind the scenes on a show such as the Bachelor and planning the dates the couples go on,” she added. Mary similarly daydreams about being a radio presenter on 947 and becoming the next Anele Mdodo. The extroverted individual is able to hold a conversation with anyone she meets and claims that she could even be a Survivor contestant one day. Eugenie Sayegh, Mary’s mother, explained that there is never a dull moment when she is with her daughter and that she should follow her heart when choosing her career. “Mary is a very motivated individual who is constantly on the go. She has the typical characteristics of a driven person who will never stop until she reaches her goal,” said her mother. Another goal of Mary’s is to one day work in the marketing departments of Google, Coca-Cola or Discovery. Her creative mindset allows her to look at these companies and how they market themselves and hopes she can be able to be a part of that journey one day. Although Mary knows that her first job will be at the bottom of the food chain, she is determined to gain experience and work her way up in the right way. A video profile of Mary Sayegh produced by Sanet Oberholzer. “If I have to start off as an intern and learn what goes into producing a radio show and how the production of a television show works, I’ll do it,” Mary said. “It’s all about the experience and gaining knowledge. Imagine being able to have your own radio show and your producer is off sick that day. Due to previous experience I would hope that I would be able to produce my own show if need be,” she added. No one knows what the future has in store, but Mary is sure about one thing. She knows that one day she will find the right career for her and be able to put her creative mind into the best use possible.